New Delhi: Two students from Amity Institute of Education, Delhi- Preeti Gambhir and Shikha Ahuja were honored by Hon’ble Union minister (MHRD),Mr. Prakash Javadekar and Hon’ble Union Minister of Electronics and Information & Technlogy, Mr. Ravi Shankar Prasad during National Convention at Vigyan Bhawan, Delhi recently for their initiatives of disseminating awareness amongst people about digital economy and cashless modes of transactions. The nascent seeds of the Campaign -VISAKA may be traced to Honorable Prime Minister Shri. Narender Modi’s address to the nation in his Mann ki Baat(broadcast on 27th November 2016) where he had urged the youth of India to create digital payments awareness among masses. Taking cue from it,, Mr. Prakash Javadekar decided to launch National Digital Financial Literacy Campaign involving the higher education institutions of India .Thus, VISAKA (Vittya Saksharta Abhiyaan) was launched with the aim to actively engage the youth and students of the higher education institutions of India to motivate and encourage all payers and payee, to use digitally enabled cashless economic system for transfer of funds. The campaign commenced on December 12, 2016 and concluded on February 12, 2017. 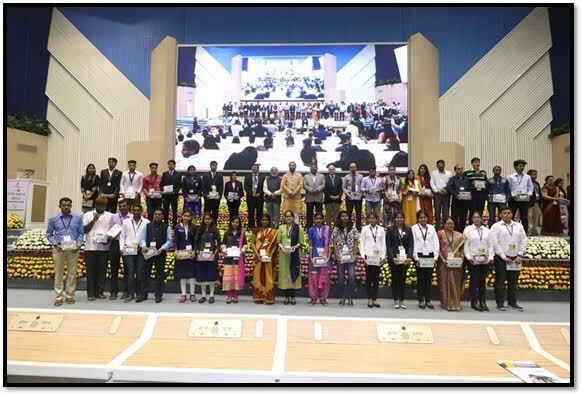 The National Convention was, thus, organized as the culmination of the campaign and to facilitate and acknowledge the commendable work done by student volunteers from all over India and to motivate the future volunteers. The student volunteer team from Amity Institute of Education (AIE), New Delhi was led by Prof. Ranjana Bhatia- Principal and faculty-Dr SanjnaVij. Over 400 successful student volunteers, awardees and other representatives of the institutions including principals, vice-principal, directors, chancellors and vice chancellors and faculty members attended the Convention. The VISAKA campaign at Amity Institute of Education was spearheaded by Preeti Gambhir and Shikha Ahuja (B-Ed trainee 2nd year). Whatsapp Group was made especially for this purpose and the information on how to become volunteers for this campaign was shared with the help of step by step snapshots of the process. Preeti and Shikha trained and informed these volunteers on phone calls, Whatsapp group, Facebook group and through class presentations, who in turn as volunteers educated their classmates, family members, neighbours, shopkeepers of the local markets etc to use plastic money in their daily transactions. Under the programme, student volunteers imparted training in Aadhaar-based payment system, pre-paid card, Unified Payments Interface (UPI), mobile wallet and Unstructured Supplementary Service Data (USSD).